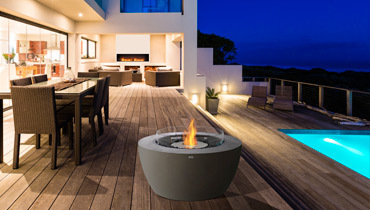 Fire in itself, in its original form, pure elegance and beauty – that’s what EcoSmart Firestands for. 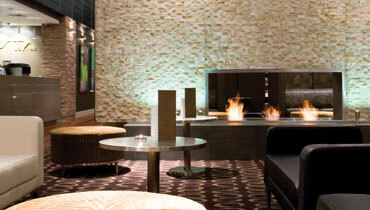 The exclusive premium bioethanol fireplaces reduce fire to the essentials: the flame. No smoke. No soot. No ash. No glowing embers. Just the flame. This is possible thanks bioethanol, a sustainably produced fuel. This is extracted from crop residues and distilled into 96.2% alcohol. Together with tannins and bitter substances that prevent the alcohol from being consumed, the bioethanol is the basis of the pure flame. It produces fire, CO2 and a tiny bit of steam. The rest creates a fascinating dancing flame. 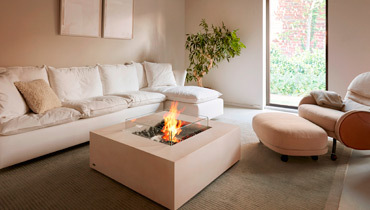 Even if ethanol fires do not produce any smoke, soot or ash – they are and remain a real fire. 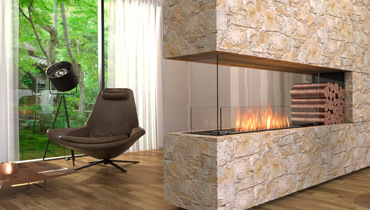 And fire must always be enjoyed with great respect; which is why the highest safety standards are obligatory with the fireplaces from EcoSmart Fire, each burner has integrated safety mechanisms and all customers receive personal inductions in how to use them. All burners have also been tested and certified by BSI according to EN 16647.
fireplaces fromEcoSmart Fire are as varied as they are elegant. 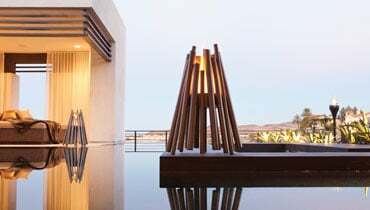 The system has a modular design: the basis of each fireplace is a self-contained burner with between 2.5 and 9 litre capacity. 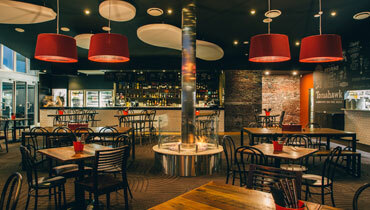 The larger burners are produced especially for the food service industry and for use in hotels, restaurants and bars, can also be used at home if the rooms are large enough. All burners are BSI tested and EN 16647 compliant. You can install one single burner almost anywhere but must ensure that all the safety distances are complied with to the letter. 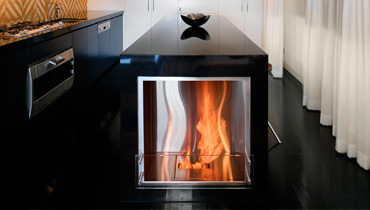 It is easier to use a stainless steel firebox with burner or new: a modular FLEX Firebox. Not only are all safety distances already integrated here, customers also have the choice between 173 different model variants (length, width, side openings, burners, accessories, attachments etc.). 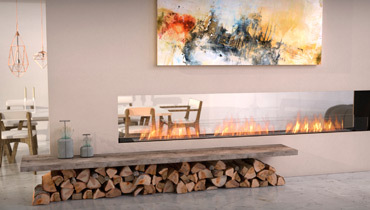 And customers who would like to have a completely finished fireplace simply have the fireboxes converted with a piece of furniture or wooden body. 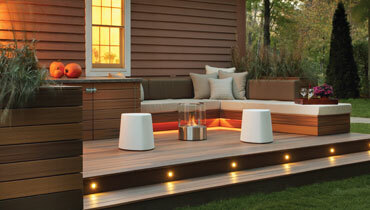 Or an outdoor model that you can set up and enjoy the flames both outdoors and indoors. 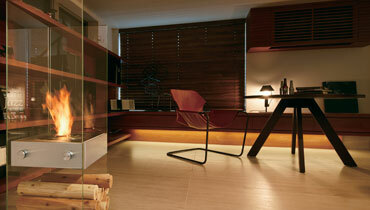 We will be happy to advise you on which fireplace is best suited to you – even from the initial idea and planning. Premium quality materials like stainless steel, concrete, steel wool etc. 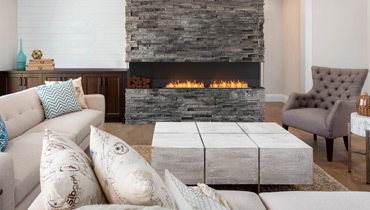 EcoSmart Fire combines premium design with the comforts of a classic fireplace. Stainless steel and reinforced concrete composites provide that certain something. 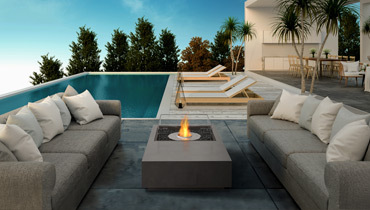 As a result, the fireplaces from EcoSmart Fire are not just used in high-end restaurants today but also increasingly in private settings in homes and outdoor areas. Planning advice (including CAD database).